I spoke at the United Astrology Conference (UAC) this week. 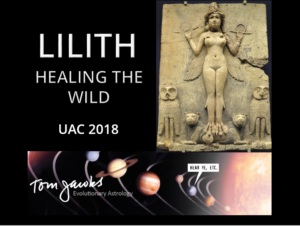 My presentation Lilith: Healing the Wild, including the presentation and outline, is now available. My approach to Lilith bypasses the assumption that she’s demonic and should be feared and vilified. Instead I paint a picture of instinct and self-trusting autonomy as natural parts of the human psyche. I consider Lilith to represent the instinctive wisdom preloaded in a human’s root or 1st chakra, and this presentation is all about learning to make room in your life for Lilith’s wisdom. My 9-step archetypal process is included in the presentation (and spelled out in detail in the book Lilith: Healing the Wild), offering a way out of the cultural assumption that if you are going to be Lilith, you are going to live an awful life full of anger and, perhaps, punishment from the mainstream for being difficult. Included with the 56-minute mp3 is the presentation as a PDF. As my slides are mostly black, I also include a PDF outline of its contents if you want to print it. The Black Moon Lilith Natal Report covers your natal house, sign, and aspects, as well as transits and progressions to your natal true BML for the next 5 years. 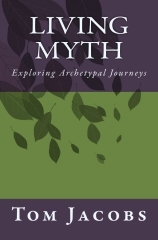 Living Myth: Exploring Archetypal Journeys, a nonastrology book that introduces how I tease apart myth (social instruction) from archetype (how the human psyche is wired) and covers 11 archetypes including Ceres, Persephone, Pallas Athene, Vesta, Chiron, Lilith, Lucifer (1930), Arjunsuri (20300), and others. The Lilith Intensive MP3 Set (click here then scroll down), 7 hours of audio taking my Lilith book as a starting place but going deeper into the archetypal experience and practical life applications of living with the energy. Chiron in Aries: Do you have the right to say “no”?